Hillbilly Racing has signed Chuck Hossfeld of Buffalo, NY to drive the Hill Enterprises #79 Pontiac on the NASCAR Whelen Modified Tour. This partnership combines one of the WMT’s top teams with one of its top young drivers. Hillbilly Racing has been a top WMT team for nearly a decade. Based out of Westfield, NC, the team travels north every weekend to compete at the highest level of modified racing. 2005 was another successful season for Hillbilly Racing, finishing ninth in the points with driver Mike Christopher. It was the fourth consecutive year the team has finished in the top-ten in points. 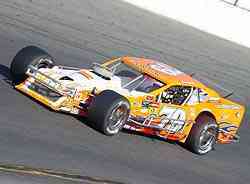 Hossfeld has been competing on the Whelen Modified Tour since 2002. During that time he has five victories and has finished in the top-ten in over two-thirds of the races. He has finished in the top-three in the point standings in three of the past four years including a third place finish in 2005. Hossfeld spent last season driving the Don Barker #50 after spending three years in the Bob Garbarino #4.